Location: Located in Peninsula on the south side of W. Streetsboro Rd (Rt 303) west of Riverview Rd. Cedar Grove Cemetery is on land that was once owned by the Bronson family. Although they owned the land much earlier, the Bronsons did not arrive in Boston Township until 1824 in order to capitalize on the coming of the Ohio & Erie Canal. Hermon Bronson first deeded the land to Boston Township in 1836, but reserved the right to graze cattle on any part of the cemetery that was "unoccupied." In 1850, the Bronsons re-deeded this land to Boston Township free and clear of any grazing rights. The earliest known burial in Cedar Grove Cemetery occurred in 1824. A Gothic stone mausoleum was constructed in Cedar Grove in 1879 for the sum of $1425. Those who passed away during the winter would rest here until the ground could thaw in the spring. Since many of the mausoleum's original features remained, the Union Cemetery board restored this remarkable building in time for its 125th anniversary in 2004. Cedar Grove Cemetery is also an important link to the community's Civil War heritage. A total of 141 brave men from Boston Township enlisted to serve in the Civil War. There are over fifty veterans of the Civil War buried in Cedar Grove Cemetery with twenty-five of these men dying in service to their country. Cedar Grove Cemetery also houses the Civil War cannon which was refurbished in 1988 and the Boston Township Soldiers' Monument which was donated by Colonel Arthur Latham Conger and his wife, the former Emily Bronson, in 1889 to honor the community's Civil War veterans. 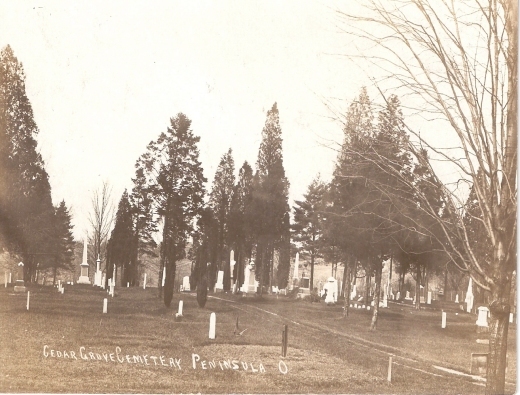 The Monument was moved to the cemetery from the intersection of Route 303 and Riverview Road in 1932.